WW1 Reenactments Equipment : Great War Tommy WW1 Documents, Paperwork : Canadian Forces Musketry book cover. WW1 Reproductions and WW1 Reenactors Equipment / Kit - Canadian Forces Musketry book cover. Canadian Forces Musketry book cover. 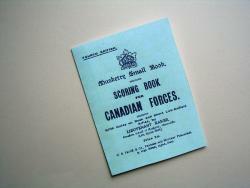 Small cover for the Musketry Scoring Book for Canadian Forces. For use with the Ross and SMLE. Cover only. Canadian School of Musketry, Shorncliffe, England.